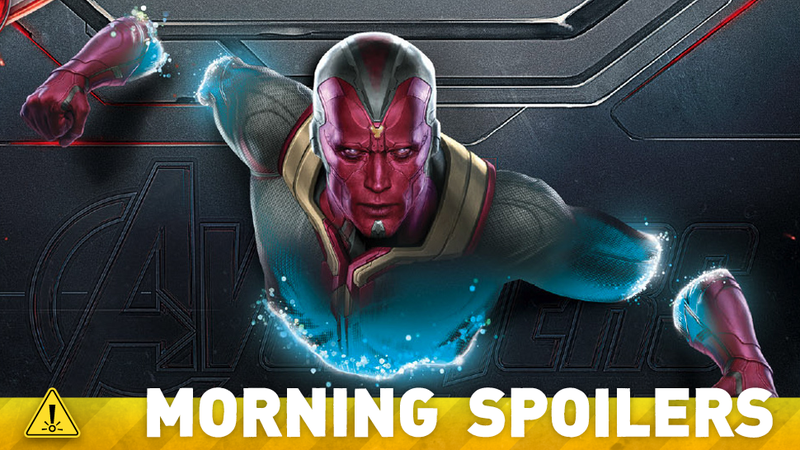 What Does Marvel Have Planned For Vision Beyond Age Of Ultron? Katie Cassidy delves into Laurel's role as Black Canary on Arrow, while we learn more about the future of both time travel and the Rogues on The Flash. Plus, release dates for Ghostbusters and Salem's return, and our first look at the midseason première of Agents of SHIELD. Spoilers, ho! That's the really great thing about the Marvel gig for me. I have never known if I have had a job six months out ever in my life. And now I know that they have plans and I can be even more judicious about the stuff that I do outside of that work. I can wait for the right thing and feel really attached to it. The Aykroyd family is delighted by this inheritance of the Ghostbusters torch by these most magnificent women in comedy....My great grandfather, Dr. Sam Aykroyd, the original Ghostbuster, was a man who empowered women in his day, and this is a beautiful development in the legacy of our family business. "I really wanted to tell the story of a young Reed Richards," says Trank, noting he was especially inspired by a scene in the Ultimate [comic] book of Reed as a child prodigy tinkering in his garage. "I really wanted to see science in science fiction, which I think we rarely see," [Trank] says. That extended to the costumes. "[We wanted] to create these suits that had a real science function to them," says Kinberg, adding that Trank "termed them containment suits to contain their powers." "The most important thing about the Fantastic Four," Trank says, "is that this is a movie about a family." Lastly, comic book readers are well aware of certain cornerstones associated with Black Canary. She possesses the Canary Cry. She becomes a founding member of the Birds of Prey. She also gets brutally beaten in the "Green Arrow: The Longbow Hunters" miniseries. Which arc would you like the writers to explore? Personally, I feel we do a really good job at tipping our hats to the comics and making the fans happy. Our writers are so brilliant and amazing. They will figure out how to serve justice to all of those story lines, whether it be in the same form or not, such as the Canary Cry. Will we see it? I'm assuming yes, but in what form we see it, I have no idea. In some way, in some capacity, they will fulfil all of those story lines. Laurel's transformation into the Black Canary will really culminate after the trilogy, in an episode aptly titled "Canaries.". There's going to be some really crazy, badass scenes of the Canaries fighting. You'll be surprised how much Sara is a part of Laurel in season 3 in her going from avenging her sister's death to honoring her sister's death to becoming her sister. Sara is so much apart of season 3 as a character even though she's physically not there. It stays with her and the show. It's what gets Laurel out on the streets. It's what she wants to do. She has a choice. The difference between Sara and Laurel is that Sara didn't have a choice. When her and Oliver were on the island, she had to go through that with him. Laurel has a choice. She takes her sister's position, but it comes from her heart and again avenging her sister's death and honoring her sister. If you've seen the pilot, you know in some subsequent episodes, certain individuals have certain knowledge of certain events that they wouldn't have if they didn't have access to the future. So yeah, if you're a fan of the comics, you know. "The Flash," ultimately is all about time travel. And you'll start getting some more hints of that. But hopefully, again, like I always say, we have to satisfy the comic book fans, but we also have to satisfy the regular fans. And for the regular fans, it's all brand new to them, so they're just kind of going with it. And for the fans of the comic, like trying to create and layer surprises that they're both having their expectations met, but then also having them subverted in a way that they enjoy and they're not angry at. I think this season is really about introducing them all. We have Episode 16 which is we're going to have Captain Cold, Heat Wave and Lisa Snart — Golden Glider. And obviously, we've got the Trickster in Episode 17. Those dailies are incredible. Yeah, I mean, we're going to do something with all the Rogues. I can't promise that it will be this season, but definitely. We know that the original "Flash" series, if they had gotten a second season, both John [Wesley Shipp] and Mark [Hamill] have told us that the first episode was going to be a giant Rogues episode. So that sounds like maybe a good thing for us to do, what they didn't get the opportunity to do. When you reach what's going on in 'The Flash' at that point in the season, Barry is really at a crossroads. Having Felicity come by exactly when he needs her really plays into the whole storyline. It's fine because as Marc said, Ray Palmer is all about technology and STAR Labs is all about technology. We get to see Ray so happy to be in STAR Labs… With Cisco [Carlos Valdes] and Ray, they're new best friends. The STAR Labs team is going to help Ray further his ATOM project. Henry Parrish returns armed with John Dee's Grimoire, a powerful book of demonic magic, with a plan to reconstitute Sleepy Hollow's long dormant – but at one point powerful – coven of witches. His initial attempt is met with noticeable, albeit limited, success, prompting him to seek out an ally in his cause. As Crane and Mills investigate three separate incidents related to Henry's handiwork, they are lead to one of the many duplicate copies of the Liberty Bell, the repeated peal of which appears to have prompted recent cases of unexplained, uncontrolled rage in some of the town's residents. Following some research, they discover the bell's provenance had been closely associated with an "Awakening" ritual that sparks the powers of those with Witch heritage... which, in Sleepy Hollow, potentially numbers among the thousands. Meanwhile, Katrina – intrigued by her recent encounter with the Warlock Solomon Kent – tries to make sense of his prophetic warning about her more powerful "dark side," and gets an unexpected, though not wholly unwelcome, visitor, which puts her and Ichabod at direct odds. And Jenny tells Abbie and Ichabod what she's learned about the true nature of Frank Irving's soul... that it is still under some sort of demonic control. This realization is proven out, complicating the team's current mission even further, and forcing Jenny to resort to drastic measures. Here's a few set pictures from the show, featuring Robin Hood and his family and a night shoot at a Marina. You can check out a couple more images here and here, and then head over to YVRshoots to see more.